For a portable outboard to be great it needs to be compact, lightweight and powerful. With the F9.9F Yamaha has delivered beyond expectation. The FT9.9G is based on the standard F9.9 with one big difference; a higher gear ratio allows this motor to spin a larger propeller minimising slippage and getting more power to the water when you need it most. •Perfect for yachts or pontoon boats. 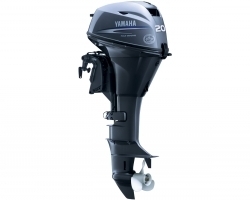 The FT9.9G comes standard with Yamaha’s patented dual thrust propeller that allows exhaust to escape in the opposite direction when in reverse. This gives the propeller access to undisturbed water in both directions for better traction and effortless maneuverability.